Shaping and controlling content from creation to final disposition means many different things. Enterprise content management needs to adopt a holistic approach to managing the entire lifecycle of document creation, sharing, consumption, reuse, knowledge and records management, archiving and disposal. 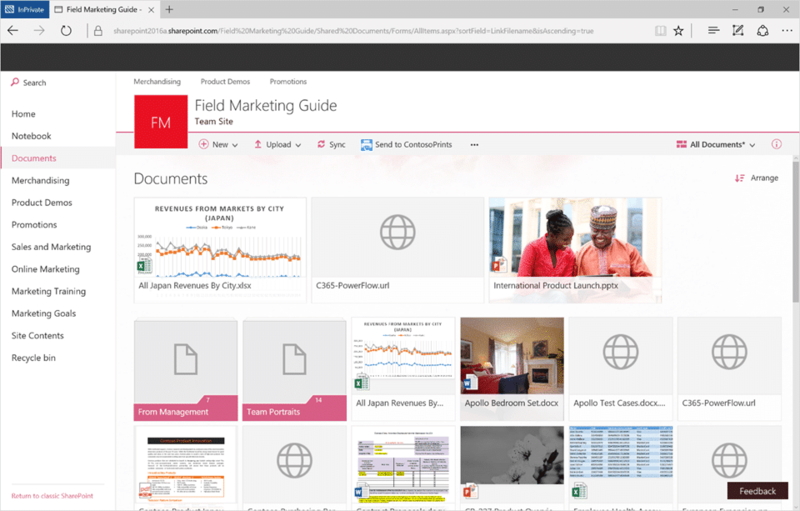 Microsoft’s Content Services reflects a more focused suite of empowered capabilities than traditional ECM (Enterprise Content Management), and represent the next wave in ECM. Content services is people-centric, allowing for personal management (copy, move, hashtag) and organizational management (knowledge management, record retention, information lifecycle management). Policy and security protects content at all phases of its life. It’s a core tenet that content should supply business value throughout, instead of after-the-fact management of dormant assets. What happens when all that content comes into SharePoint? A common, incorrect impression of SharePoint has been that it’s a great tool to manage team content, but you need an “old-fashioned ECM system for scalability” or “true records management.” Neither of those are true today, with SharePoint having incredible scalability of up to 30-trillion documents and up to 12.5 EB in a single SharePoint Online tenant. OneDrive and SharePoint also inherit Office 365’s capabilities to create record and retention policy tags that can be applied to any content (interactively or by matching a known set of content fingerprints). Content services is as much about document creation as consumption. In many cases, content has become less about static images and reports, and more about dynamic documents that are created and edited many times in their lifespans. This trend is something called content velocity, where the content picks up velocity as it is created, edited and reused, becoming more valuable, instead of becoming a dormant archive of little value, as was traditionally the case. This is viewed as an evergreen cycle of authoring, collaboration, control and reuse. Creating a document using Office Lens to share to OneDrive for Business and SharePoint. Using the Copy/Move functions to publish that document to a SharePoint team site and its group members. Using SharePoint Content Types to assure that new documents are “born” with templates, rich metadata and retention policies. OneDrive for Business is the best place to store and manage your documents, giving you the “My Documents” concept on any device. As you share and collaborate with others, content evolves and picks up velocity. When final, you can easily bring it to SharePoint for publishing and permanent storage. 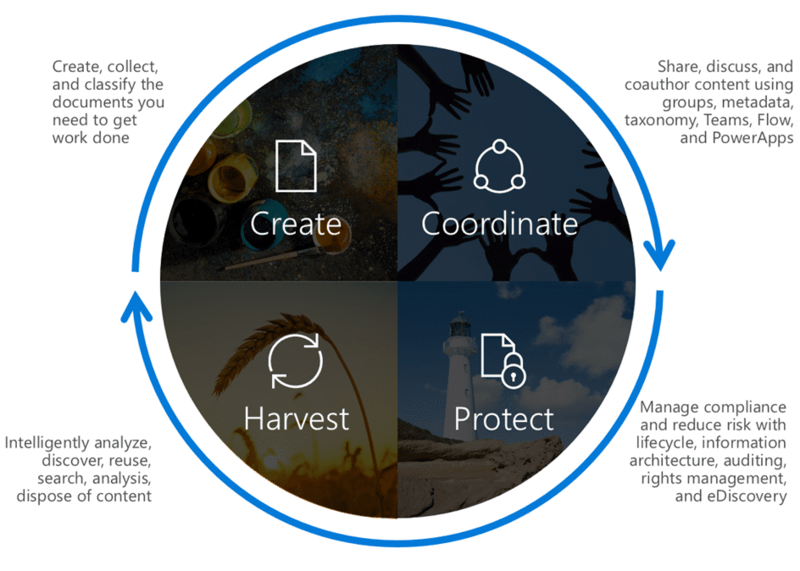 Content in SharePoint is maintained in modern document libraries, making it easy to structure graphically rich, dynamic views of content and metadata. SharePoint’s managed metadata service provides a centralized way to tag and classify information. Tagging and customizing the view can all be accomplished from the library home screen, eliminating multiple clicks to open a property editing screen. Documents in libraries can be easily shared to Office 365 Groups, and reused in other collaborative apps like Microsoft Teams. In addition, Microsoft Flow can be used to automate common actions, like collecting attachments from email or distributing documents for team review. Information Rights Management—Files can be encrypted using Azure Information Protection/Rights Management Service and can still be used at supported endpoints, including browsers, rich clients and mobile Office clients. Office 365 document retention tags—This new capability offered across Exchange, Skype, OneDrive and SharePoint allows an administrator to centrally define a policy tag in the Security & Compliance Center to enforce document retention and deletion policies. Tags can be set through code, default settings or user actions, and can be auto-applied based on sensitive information types or keywords. Data loss prevention (DLP)—The Security & Compliance Center provides a central point to define policies for 81 predefined information types, such as EU Financial data, and/or create other custom information types. When these types are detected, users can be advised about the policy, or even automatically blocked from sharing or distributing sensitive information based on the dynamic policy definition. Auditing—When combined with unified auditing in hybrid deployments of SharePoint 2016, Office 365 can provide integrated logging of user and administrative actions on content for both on-premises and cloud-based SharePoint and OneDrive locations. Content shouldn’t be saved and stored and managed just to fill up storage space. 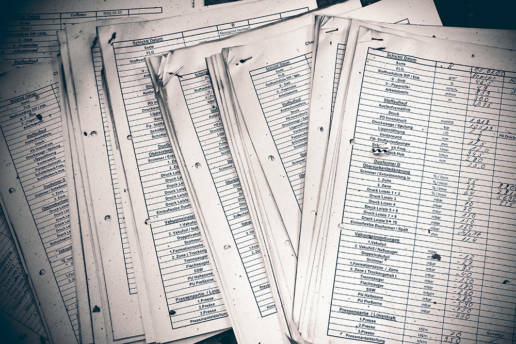 Traditional ECM often concludes with document disposal or retention. We believe that modern content services are cyclical. Content exists to support a future business purpose, such as providing information on a related decision, explaining a historic context or seeding the next cycle of content creation.